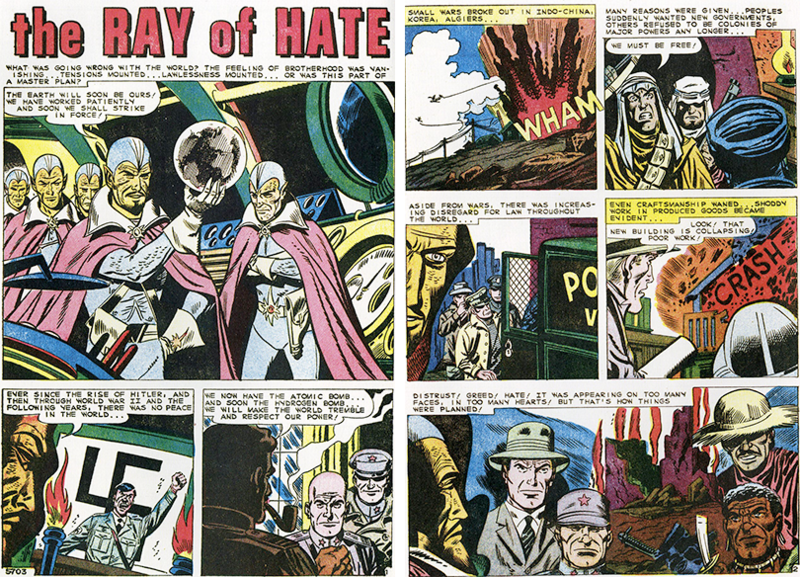 The genre of “pro-war” or at least war-themed comics has long dominated the comic book field, especially during times of war. This is at once a form of propaganda and entertainment. It was certainly effective inspiration for many young boys. The Unknown Anti-War Comics: Featuring the Art of Steve Ditko of Spider-Man (IDW Publishing) edited by Craig Yoe, reveals that there was an element of dissent in the comics world. 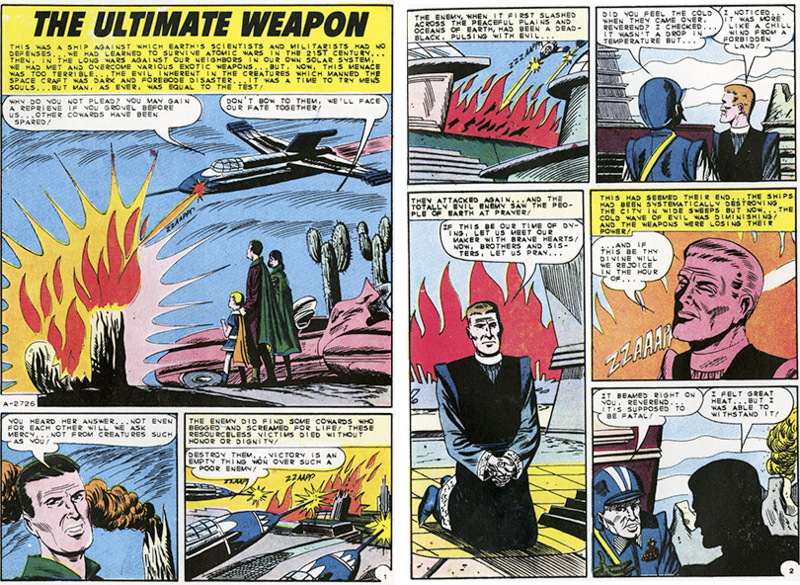 I queried Yoe about when and why anti-war comics began and the semi-secret legacy that he has uncovered. 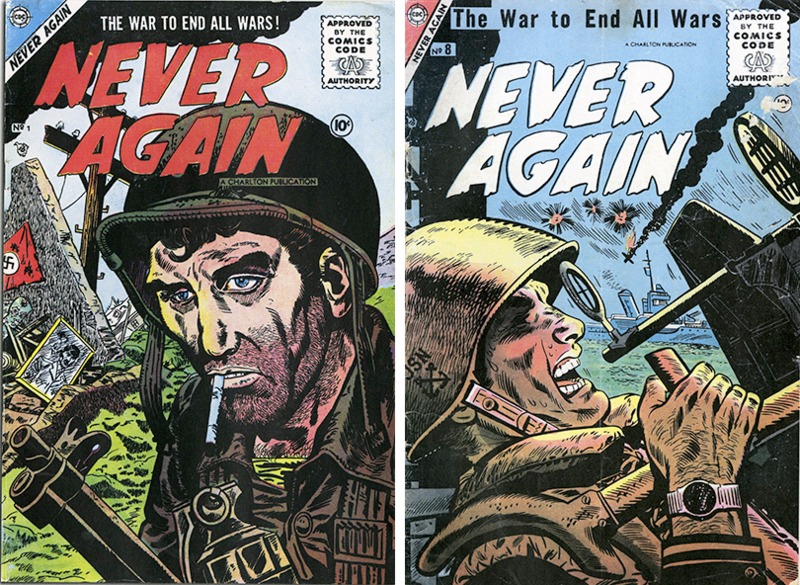 Yoe cites “Never Again” as the first anti-war comic. It’s origins are a bit murky. 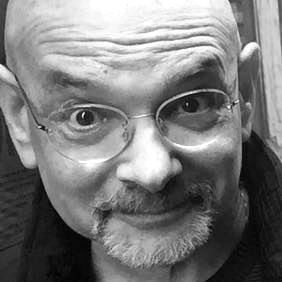 He suspects that “Never Again” was packaged for a publisher that maybe sat on it for a while, but then went out of business and the material was bought by another publisher. Charlton Comics eventually printed it. “The Derby, Connecticut-based outfit, was dedicated to keeping their self-owned presses running around the clock not always caring a whit what the content was.” So “Never Again,” with its post WWI slogan-inspired title, kind of slipped in. This mid 1950s comic book only ran two issues, they were haphazardly, quizzically (Charlton’s oft M.O.) numbered #1 and #8, and the title was immediately canceled. Possibly the comic went defunct due to low sales, but more likely because that was all the material they had on hand and the powers-that-be at Charlton simply moved on to something else! But what incredible stories there were in “Never Again” and totally singular in their point of view! Here are decidedly anti-war, pro-peace, gripping yarns in a field that churned out jingoistic propaganda war comics by the many thousands. I feel the “Two Men in the Sky” from “Never Again” is one of the most powerful, profound, and innovatively told stories in the comics medium. In fact, there was virtually no dissent against the Korean War in comics. “The war comics of that time had some of the most distorted caricaturing and demonizing of Asians to be found in the history of the pulp propaganda. A low of the lows,” he says.